Stihl’s pro cordless disc cutter is a unique product to cordless range of machinery , the cordless disc cutter is great to use on thing such a roofing tiles and small pipe work. The positive to the stihl cordless disc cutter is its easy to use just pop in a stihl battery and away u go . the stihl tsa 230 is light weight and compact making it the best 9 inch cutter on the market today. the stihl tsa 230 only weights 3.9kg . 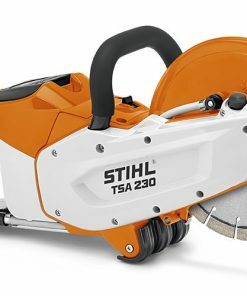 The water connection and vacuum accessories ensure effective dust control when using the stihl tsa 230 cordless disc cutter. Supplied with a stihl abrasive wheel for cutting steel as standard .